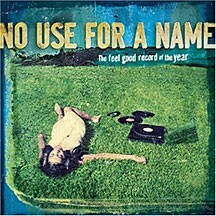 Album by No Use for a Name. Fat Wreck Chords. For fans of West Coast melodic pop-punk it'd be hard to find a better new album than The Feel Good Record of the Yearfrom established masters of the genre, No Use for a Name (NUFAN). When Tony Sly and Rory Koff started NUFAN back in 1987, as frontrunners of the skate-punk scene, they could not have foreseen the incredible success their band would experience. NUFAN is the first and only Fat Wreck Chords band ever to have had a video on MTV, and Feel Good... marks the band's 9th proper studio release. The album was recorded at Colorado's Blasting Room with the guidance of veteran producer Bill Stevenson, who recorded such punk-rock giants as Descendents and Black Flag. The album begins with a classic punk-rock device: an ironically placed quote — this one sounds like a staticy old radio broadcast announcing an interruption in regular programming — that introduces the first track's pounding instrumental opening. As the vocals come in, it is clear that NUFAN is in their usual good form, stretching the boundaries of the pop-punk genre even as they continue to define it with driving guitar riffs, super-fast drums and vocals so melodic that they just might bring a tear to the eye of even the most hardened veteran of the mosh-pit. Following the recent trend of other Fat Wreck Chords founding bands (NOFX, Lagwagon), NUFAN continues to exhibit increasing political awareness. The cover art coupled with the album title becomes a scathing commentary on the tendency of the privileged to ignore the world around them. On the cover, a woman lounges on a field of well-tended grass, headphones in her ears and records splayed on the ground about her, completely oblivious to the cloud of black smog that smears the distant horizon. And like recent releases from Lagwagon and NOFX, The Feel Good Record of the Year marks a return to a harder, edgier sound, which is more in keeping with NUFAN's punk-rock roots. The melodic vocals and love songs that listeners came to love on albums like Hard Rock Bottomand Keep Them Confusedare still there, but they are interspersed with harder, more politically-charged songs. Songs such as "Under the Garden" showcase lead singer and songwriter Tony Sly's vocal ability and lyrical brilliance with haunting melodies and lyrics that drive the message home with the force of an elbow to the teeth: "You're totally oblivious to world poverty / not affected by the millions that you don't see." The album ends where it began, with a reprise of the radio announcement that kicked off the album, this time announcing a return to regularly scheduled programming. By the end of the album it is clear that the soccer-playing boys from San Jose are alive and kicking harder — and better — than ever. The Feel Good Record of the Year is a further affirmation that punk is not dead — it's just got a bad liver.